Ladies and gentleman we are honored to have an exclusive Oval Office interview with Amanda the star of a new hardcover picture book, Call Me Madame President. Tell us a little about yourself Madame President. I'm President of the United States, I live in the White House and I'm eight years old. How did you get to be President at such a young age? I have a very powerful imagination. There are reports that your older brother Freddie is jealous. Is that true? What do your parents think of your being President? Well my Dad thinks I have great leadership ability that comes from him and my mom. What do you think to do when you’re not working? Hang out with my puppy, Coolidge, play hopscotch, roller-skate, climb trees, and annoy my brother. 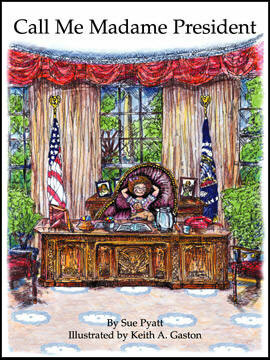 Call me Madame President is a GREAT adventure book for kids from the ages of three to eight years old. This story is told in rhymes, tell the tale of a little girl who dreams of being President of the United States. Amanda's older brother taunts, "You can't until you're thirty-five ya know, Amanda you have twenty-seven years to go." Ignoring that, in the first story, Amanda takes the reader through the beautiful sights of Washington D.C. as she performs as President all over the city and the White House. There is a gentle, underlying theme of sibling rivalry since Amanda wants to who her brother a thing or two. In the second book. Amanda gets out of Washington and takes a lovely tour of the country for her re-election campaign. She wins in a landslide and has her inaugural ball at The Mayflower Hotel. The secondary plot: Along the way, she loses her dog, Coolidge. They are reunited at the local animal shelter where she adopts a kitten. Amanda then displays her concern for animals and successfully uses the "bully pulpit" to teach Americans to adopt shelter pets. The main theme of each book is: DREAM BIG! I hope a little girl will read my books and be inspired someday to make that journey to the White House to lead a country. How can we inspire little girls to want to be leaders at the highest level of government? My answer is through books. We are all familiar with the traditions of telling our sons they can be anything they want to be including president. How many times have we explored this possibility with our daughter’s? Anything is possible. I hope that Amanda's charm will inspire little girls to investigate the reality of women in the political arena.